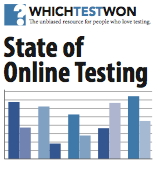 Today our friends at WhichTestWon released their annual State of Online Testing Report, with some interesting findings that dovetail nicely with TrustRadius’ conversion rate optimization (CRO) series of buyer’s guides. Like TrustRadius, they are not part of any testing agency or software firm. Their goal is to evangelize, educate and inspire more digital marketers to test for better conversions. More marketers are testing, more of those who are testing are seeing results, business is booming for testing tech and services vendors, and more companies plan to grow their testing efforts. According to the WhichTestWon survey, a whopping ZERO percent of respondents plan on reducing testing staff in 2015. Similarly, a recent TrustRadius survey showed that 48% of companies expect to spend more on testing software in the coming year. WhichTestWon says that while e-commerce and lead generation marketers are doing the most testing, the biggest area of growth was among engagement marketers. With more transactional goals such as a sale or a form fill, it’s easier for e-commerce and lead generation marketers to measure results. Given this rise in engagement and brand-focused tests, testing software vendors will have to make it easier for marketers to set up engagement goals and measure ROI. 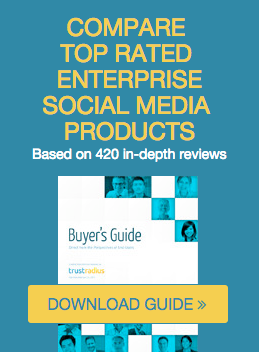 For our upcoming Buyer’s Guide to A/B Testing Software (coming in October! ), we talked to ten experts in the CRO industry, all of whom emphasized the importance of understanding your visitors and customers in figuring out what to test. 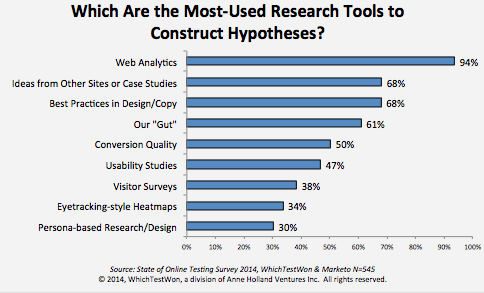 Yet, according to WhichTestWon’s report, ideas from other websites, best practices, and people’s “gut” (all “navel-gazing” activities, the report says) are used more as research tools than usability studies, visitor surveys, heatmaps, and persona-based studies. There hasn’t been a corresponding growth in the use of sophisticated testing practices such as segmentation, multivariate testing, and dynamic content. This matches TrustRadius’ finding that, while testing vendors are really excited about personalization, it’s still not a widely adopted practice among testers. Experts and consultants we spoke to see its potential, however, especially as it becomes more automated through machine-learning and predictive capabilities. You can download the full WhichTestWon report here, and stay tuned for our upcoming Buyer’s Guide to A/B Testing Software.